The CAS challenge on SCS today is to use paper piercing. I do LOVE paper piercing and couldn’t wait to play along. There is a new collection of Stampin’ Up! paper piercing templates – Eclectic Paper Piercing Pack and one of the templates goes along with the tag from the Chalk Talk Framelits – for my very favorite tag from that. So put it together and this is what I got! Blushing Bride – cut out Chalk Talk tag, emboss believe in white. Stamp small feathers using versamark on Vellum cardstock and white emboss. Cut out. Tie bow in White Baker’s Twine and add to tag to finish off. 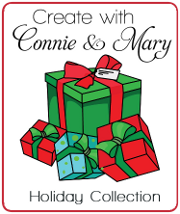 Create with Connie and Mary Holiday Collection 2014 has BEGUN! We are featuring the Christmas/Holiday (no Halloween/Fall) products from the Holiday Mini! Collection runs for 4 weeks – 24 AMAZING projects that are perfect for your holiday classes and camps and gift giving! Our design team is AMAZING and you don’t want to miss out! The cost is $29.95 for 4 weeks of projects seen only by our subscribers. Our projects are NOT shared on our personal blogs or out on the Internet. Head over to Create with Connie and Mary to learn more and to subscribe today! This entry was posted in Challenge, Clean and Simple (CAS) and tagged Four Feathers, Good Greetings. Bookmark the permalink.